TELEPHONE CLASSES TO EUROPE AND AMERICA: These classes are available to people overseas by teleconference. People in Jerusalem my also dial in, and they may also attend the class in person while it is being taught through skype at Sarah Yehudit’s home in the Old City. These classes are recorded and available as mp3 files for individuals overseas who want to sign up for the class and receive the weekly recordings. Zohar, Page by Page. 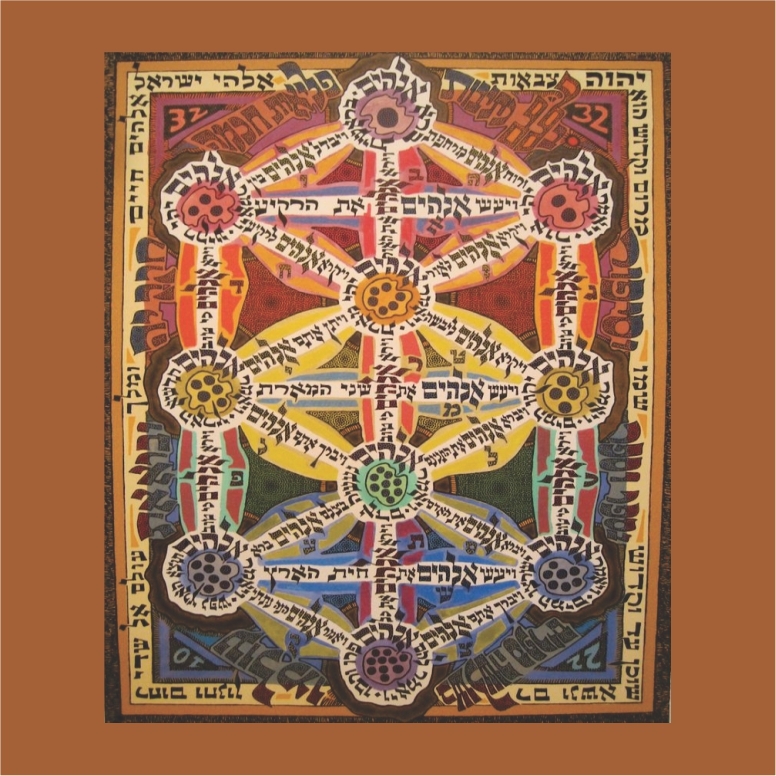 The Zohar is the central work of Kabbalah. 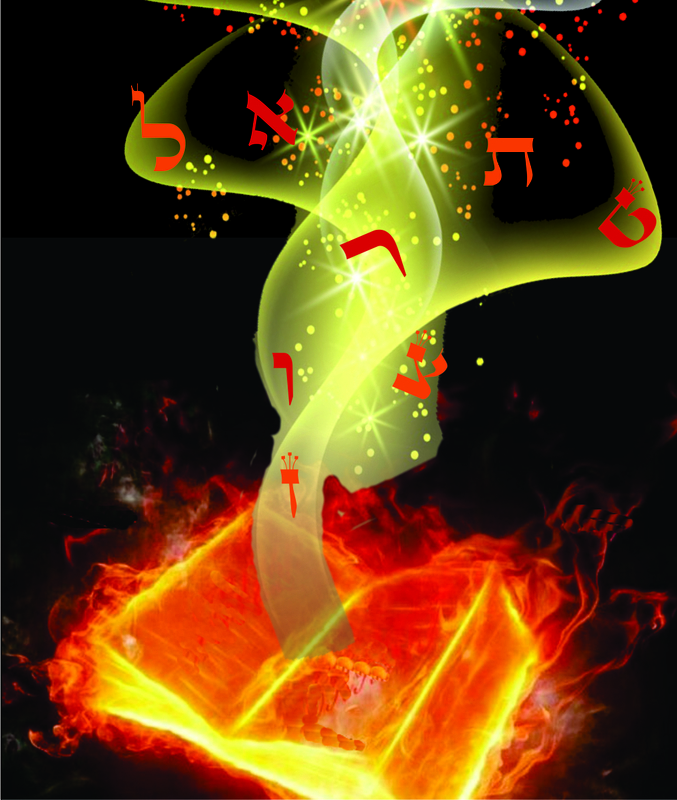 It is actually comprised of several works, the most well-known being a mystical commentary on the Torah’s five Books. 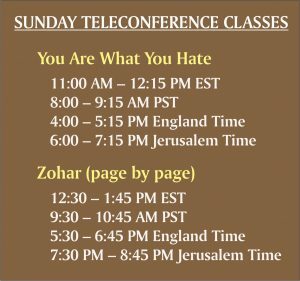 The Zohar Class started in 2008. We are moving through the Zohar page by page. We are using R. Yehuda Edri’s Hebrew translation of the Aramaic Zohar as our text (which Sarah Yehudit provides). Students have their own English translations as well. (Sarah Yehudit will provide Soncino’s English translation upon request). Hebrew fluency is not required for the class. All Hebrew is translated and the discussions are in English. Sarah Yehudit prepares the text with a variety of commentaries but draws primarily from Zohar Chai and Demesek Eliezer (from the Komarna school of interpretation). The class is via teleconference. Students phone in from throughout the world. The teleconference hub is a US number. Folks from overseas use Skype-out (or a phone service of that sort) to call in at negligible expense. The students are quite diverse and represent the full range of denominations, non-denominations, and post-denominations. Their common bond is a shared passion for the depth and beauty of our wisdom tradition. The class was originally open to both men and women, but only women have attended for several years now. The class is recorded and those sound files are available for anyone wishing to study a particular passage, or to follow the class from its beginning. To purchase archives of this class, or to follow it in the present, click HERE. 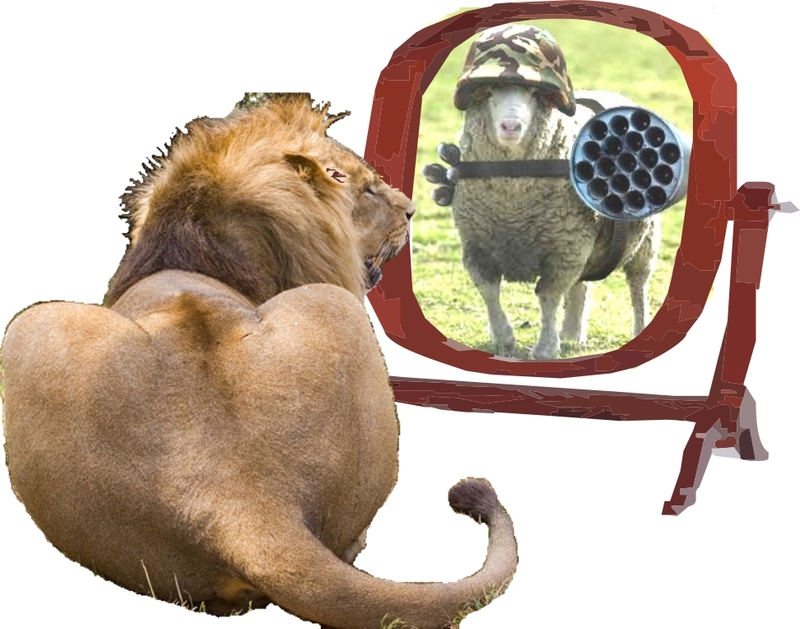 You are What You Hate: A Spiritually Productive Approach to Enemies – The Baal Shem Tov teaches that enemies are always upside-down soul-mate. The question becomes, what is the most most good-serving, G-d serving (and, surprisingly, self-serving) response to the testy of enemies and how can I sue their vexation for positive change?. The class is comprised of mature professionals—skilled and practiced meditators—whose knowledge and observance of Judaism runs the gamut. The class is open to both men and women. 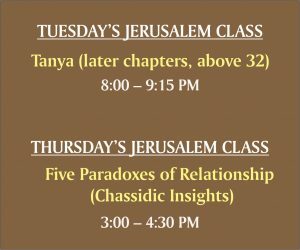 JERUSALEM CLASSES: These classes are recorded and available as mp3 files for groups or individuals who want to sign up for the class and receive the weekly recordings. 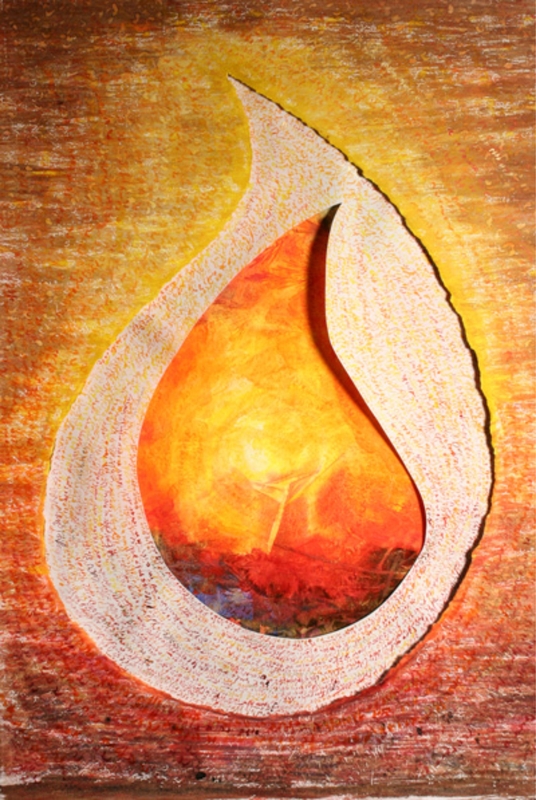 Tanya—Later Chapters (33 – 53): Tanya is a systematic presentation of the Chassidic world view. All other chassidic writings view a subject (for example the parsha) from a chassidic perspective and the reader must intuit its underlying principles. Tanya presents all this in a systematic form. The Tuesday class has studied the earlier chapters previously and so we are beginning with the later chapters that offer deep and practical guidance about how to translate the teachings into a spiritual path. Place: Chabad St. 90/16 (Jewish Quarter, Old City). Last Jewish apt. complex before Armenian Quarter in the direction of Zion Gate. Entrance is above the street that passes between the two parking lots and then heads down to the kotel. Brass Gate into courtyard. Left entrance, left staircase, third floor, #16. Newcomers and visitors are welcome. 30 shekels per class (or whatever you can afford). Contact Person: Sarah Yehudit ([email protected]). Or phone (02) 628-2988. Sarah Yehudit’s Tuesday night class began this round of Tanya study (beginning with chapter 33) after Pesach of 2017. We studied the earlier chapters together many years back. 1) Autonomy vs Dependence; 2) Sharing vs Privacy; 3) Affection vs Practicality; 4) Acceptance vs Judgement; 5) Stability vs Novelty. This class will explore a variety of chassidic texts that will help us to negotiate these paradoxes as they play out in our spiritual (and relational) life. This is an advanced group of students (in Torah knowledge, professional accomplishment and life experience). The group has been learning together since 2008, but we just started focusing on the Five Paradoxes of Relationship since summer of 2018 (just before Shavuot).